What tools do people use to create levels or world maps (something with more than 1 nametable)? I need to work on a world MAP for an RPG for the NES and am curious what tools are out there. Thank you! I built my own in C#, and then later rewrote them in Python/PyQt. If you want I'd be happy to share the python tools just pm me. Don't want to publicly release them because it'd be quite a large project really polishing it up, fixing bugs and supporting it etc. But it works really well so far. It's interesting no such tool (for more than one nametable) has seen widespread adoption that I know of, so many folks wind up rolling their own. Or writing some kind of conversion script from an existing tile editor tool is another common technique people use. You'll probably have to do *something* custom. Others are content just typing in tile values straight in a text editor. That'd make compression kind of tricky to pull off without a huge headache though. I think the Mystic Searches guy is planning on releasing his tools at some point. I draw my levels using GIMP, and then I feed the level's image, along with an image of the tileset used, to a script I coded that translates the levels into a big 2D array of tiles/blocks, and then feeds that to another script that encodes the data into the format that my game engine expects. 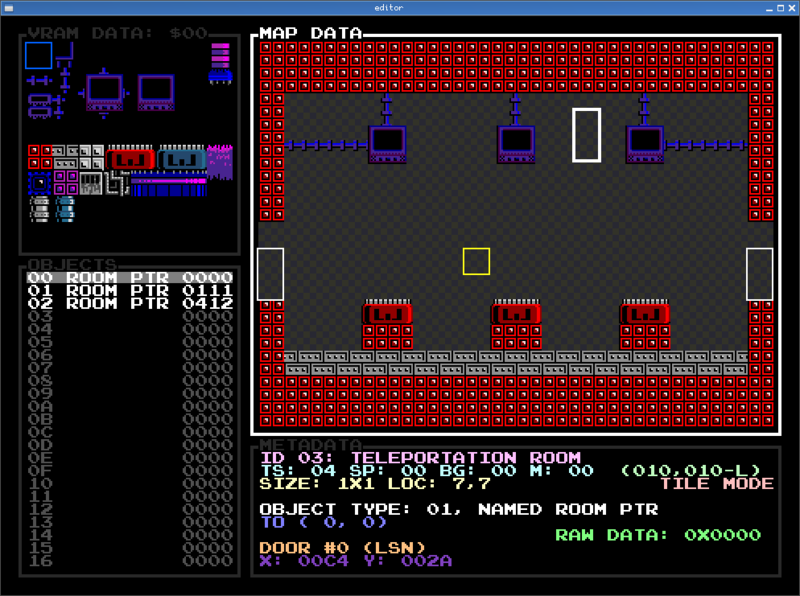 I also have scripts to do the opposite job, which's converting the binary data to a full level image using a tileset image, so I can edit levels for which I don't own the source images anymore, or so I can change tilesets without having to redraw entire maps. Most sane people would use one of the generic map editors out there, and convert their output to the final binary format, but I prefer the freedom of a graphics editor, which have configurable grids, layers, easy copy & paste, and so on. The tool is really old and requires a few vb6 dlls, but runs fine on my Win7 computer. I use a slightly customized version of Mapwin. It can do full map exports, 1 byte per metatile, which process with custom command line tools to fit whatever map format I'm using. Mappy/Mapwin's homepage is not working quite right, so here's our slightly customized copy. I do it like tokumaru, images that are fed to scripts. Depends on the project, but recently I've been using Tiled, then as part of my build process I have scripts that convert the tiled save format into my own format.